A kitchen is not the same without a double sink. Of course, with two sink drains, there is a better chance that one of them will get clogged. If you understand how the double sink drain system operates, then it will be less of a headache to install a new one. Just remember that pipes made from PVC rarely need a pair of pliers to tighten or loosen the nuts that hold the pipes together. Lay all the pieces of the kit on the floor in front of the kitchen sink cabinet. Locate the straight tailpiece and the elbow tailpiece. Install the elbow to the bottom of the sink that does not line up with the drain coming out of the wall or the floor. Do not tighten the nut all the way yet. Install this straight tailpiece to the remaining sink. Next, install the pipe that is shaped like a "T." It will slip over the end of the straight tailpiece and connect to the elbow pipe coming from the other sink. Install the "P" trap to the bottom of the "T." The "P" trap will connect to another straight piece of pipe that will join the drain system to the drainpipe coming out of the wall or the floor. Tighten all the nuts by hand or by wrapping a towel or a washcloth around the nut to get a better grip. Do not over tighten them. 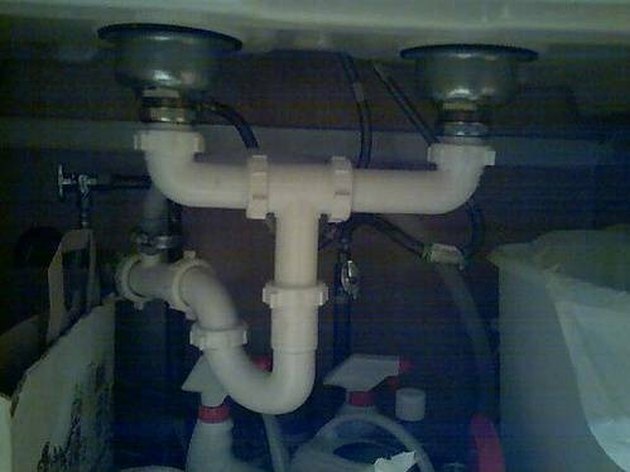 Install the two elbow pipes to the bottom of the sink bowls. Install these much like you would if they were straight pipes. Do not tighten them all the way down yet. Line up the top of the pipe in the shape of a "T" with the two elbow pipes coming from the bottom of the sinks and slip the pipes together. Again, don't tighten the nuts all the way tight yet. Install the "P" trap to the bottom of the pipe in the shape of a "T." The last pipe to connect is the one that comes from the "P" trap leading into the drainpipe in the wall. Tighten the nuts by hand, or wrap a washcloth around the nut to help secure it. How do I Install Plumbing for a Shampoo Sink?